Raffaello Sanzio was born in Urbino and died in Rome. He was the son of a painter and worked in Perugia and Sienna. He then moved to Florence to study the work of Leonardo and Michaelangelo. In 1508 he was called to Rome by Pope Julius II. After Bramante's death in 1514 Raphael became the architect of St Peter's in Rome. 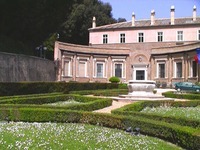 His design for the Villa Madama, on the slope of the Monte Mario outside Rome, was for Cardinal Giulio de Medici. It was intended to provide for a villa life of the type described in Pliny the Younger's garden letters and had a profound influence on the development of garden design. The villa had a circular court at the centre of the building and axially planned terrace gardens ran along the hillside.